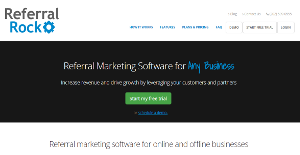 Referral Rock is an online referral marketing automation suite developed to help any business get more customers using the power of their own network. Online and offline businesses can design incentive-based programs, enroll existing customers and partners, capture the new leads and sales, then payout rewards automatically. The software works with any business type and size and can be integrated via a user-friendly embeddable widget, dedicated referral website, single sign on and registration, and online/offline conversion tracking. Referral Rock software automates every step of the process so a business can scale and consistently measure the success of referral marketing programs. The software also supports integrations with many of the world’s leading business systems, e-commerce sites, content management platforms, and shopping carts. The list includes HubSpot, WordPress, Magento, WooCommerce, Shopify, and 3dCart to name a few. Referral Rock treats users with a software that has an easy design and offers tons of personalization possibilities. Businesses can use brand images and colors for complete customization of their referral program. A business has complete customization with text and messages to help reflect their brand. Additionally, a business can create custom email templates for their customers to share with their friends. Designed and developed to ensure that all your marketing efforts lead to success, Referral Rock comes with built-in best practices. Referral Rock has all the best practices built right into the software, like dual sided incentives, personalized links, social media sharing, automatic notifications, user dashboards and in-depth performance statistics. This referral marketing platform features fraud detection capabilities that are not offered in many of its competing alternatives. A business can set up fraud or suspect rules to save themselves from abuse. Members of the program can be disabled at any time if necessary. Users will certainly maximize every marketing campaign with the software’s Reward Payouts. Referral Rock can issue gift cards, pre-paid visa cards, and coupons right from our system. Businesses can always opt to handle rewards themselves, but we’ll still do all the tracking and calculations of the rewards so it’s lined up for easy distribution. What Problems Will Referral Rock Solve? Referral Rock provides automation software that helps a business create an easier way to manage and run a referral program. Referral Rock helps businesses streamline the process so that their customers can easily share with their friends while using messaging that aligns with your brand. Get more through using a service. Referral Rock allows a businesses customers to easily share and track their progress. With Referral Rock a business has a better chance of keeping their advocates engaged in the program. Referral tracking, reward statuses, and other data can be displayed to the advocate so they stay in the loop. Plus, the software allows a business to create an easy sharing platform for their customers, meaning more chances of being exposed to new audiences. There are a lot of components in a referral program. That’s why Referral Rock provides easy reward automation for your business. Referral Rock allows you to create different types of reward payouts to help create the ultimate referral program. The right incentive can lead to customer loyalty. It's essential to realize that virtually no service in the Demand Generation Software category is a perfect solution able to fulfill all the needs of different company types, sizes and industries. It may be a good idea to read a few Referral Rock reviews first as some services might excel only in a very narrow group of applications or be designed with a very specific industry in mind. Others can work with a goal of being easy and intuitive and therefore lack advanced elements needed by more experienced users. You can also find apps that support a broad group of customers and give you a powerful feature set, however that usually comes at a more significant cost of such a solution. Ensure you're aware of your needs so that you buy a solution that provides specifically the elements you look for. How Much Does Referral Rock Cost? We realize that when you make a decision to buy Marketing Automation Software it’s important not only to see how experts evaluate it in their reviews, but also to find out if the real people and companies that buy it are actually satisfied with the product. That’s why we’ve created our behavior-based Customer Satisfaction Algorithm™ that gathers customer reviews, comments and Referral Rock reviews across a wide range of social media sites. The data is then presented in an easy to digest form showing how many people had positive and negative experience with Referral Rock. With that information at hand you should be equipped to make an informed buying decision that you won’t regret. What are Referral Rock pricing details? What integrations are available for Referral Rock? If you need more information about Referral Rock or you simply have a question let us know what you need and we’ll forward your request directly to the vendor.